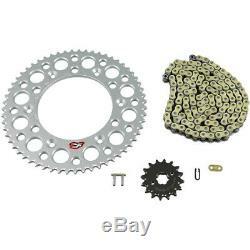 Renthal 520 to 428 Chain & Sprockets Conversion Kit 16T Front/59T Rear (K044). Improves acceleration and responsiveness with less revolving un-sprung weight. Comes with Renthal R1 Works non-O-Ring Chain. Saves more than 2 lb. Over the stock 520 O-ring chain and steel rear sprocket. Front sprocket made from super strong nickel chromoly and is grooved to clear mud and increase chain life. Rear sprocket made from 7075-T6 aluminum, precision machined with self-cleaning mud grooves and lightening holes. Image may not be actual item and may differ depending on your vehicle fitment. Before purchasing aftermarket parts for your bike, please confirm that your vehicle has USA-specified parts. If this is the case, parts ordered from a USA retailer may not fit correctly. Compare the microfiche for the USA model to your model to be sure they are the same. Perf-moto is not responsible for fitment issues caused by non-USA models. Please make sure you know the rules of your country before purchasing. Our goal is provide you with the best and easiest internet purchasing experience. We are committed to providing a great online shopping experience. The item "Renthal 520 to 428 Chain & Sprockets Conversion Kit 16T Front/59T Rear (K044)" is in sale since Sunday, March 31, 2019. This item is in the category "eBay Motors\Parts & Accessories\Motorcycle Parts\Drivetrain & Transmission\Chains, Sprockets & Parts". The seller is "perf-moto" and is located in Holland, Michigan. This item can be shipped worldwide.